I have mediated before, but not often and not with any regularity. 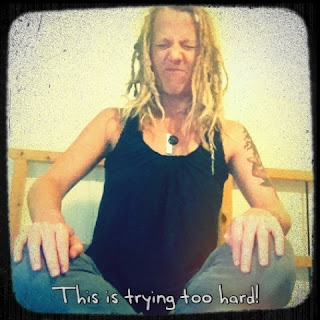 I had a period of time where I had a really bad taste in mouth about meditation practices. It was my own doing. A few negative interactions with some people who had very strong opinions and tendencies triggered some ... blecgh within me. I decided it was something I could totally live without and I wasn't going to mediate or do yoga because (insert-my-own-issues-with-just-a-few-individuals-here). Thankfully, I occasionally choose to be a grown-up and deal with my own muck. It can start with something as simple as, "Oh geez. My friend, John, meditates. Crap. I have to at least give this another look-see." Followed by the subject coming up over and over and over again. This time, I'm seeing scientific studies and good, solid facts on the benefits. I finally decided to give it a try after learning and reading and finally accepting that it just might be a very good thing for me. I'm in the middle of a 21-day challenge I've put before myself. Part of the challenge includes meditating every single day. I started with 5-10 minutes a day. Now I'm requiring a minimum of ten minutes. You don't have to do that. It's just what I am doing. Yet, I did discover that I like it. I genuinely look forward to it. Seriously. As I've been doing this, I learned specifically about "mindfulness meditation." That has become my focus. It is helping me tackle negative feelings. I also get on YouTube and search for things like "five minute mindfulness meditation." Or ten minutes. Whatevs. The point is, you'll have resources out the ying-yang right there. Am I seeing any improvement? Yes. I look forward to it. Read again, but more specifically: I (Christine Moers) look forward to sitting quietly for ten minutes and allowing my brain to focus on one thing instead of running all over the place. That's a big deal for me. I'm more relaxed. I'm falling asleep and staying asleep more than average. I grind my teeth at night, and typically wake up with a sore jaw most days despite always wearing a mouth guard. I have not had an achy jaw for at least five days. Yay! The other day I had a wave of big, bad, hairy ugly feelings. I actually stopped in the middle of it and heard the words of one of the guided meditations I had done. I used that approach with my feelings in the moment. So, um, you betcha'. Improvements! I call my skateboarding "rolling meditation" now. Whether you realized it or not, I think you and the family have been hoop meditating for a while. Talk about synchronicity! After 17 years as a Buddhist, I finally committed to a daily meditation practice this past May and WOW - it's awesome! I always dreaded meditation, like it was something necessary but unpleasant, like cleaning out the toilet bowl of the soul. :) And instead, it's bringing me such joy. In fact, I just blogged about that joy: http://50percentdakini.com/2013/07/26/joy/ Glad you're feeling it to. Wishing you stability and joy in your practice. I'm on on/off meditator. I finally gave it a shot after reading a little book I found about a Christian practice of meditation developed by some monk somewhere. It explained the process so simply, and what it actually "looked" like (the thought processes involved), that I was fearless to give it a shot. Even though I do not wake and give it deliberate time every day (I did for about a year), I still go to my quiet place when things are getting crazy, when my mind starts whirling, etc. I'm glad you are discovering it, too! What the heck does "Be still and know that I am God" mean anyway? Ha! Love it. Had learned about mindfulness meditation long ago (10+ years) ago and haven't really thought much about it since. May be the spark I needed to get back to it!